Sarah blogs about TEFL, life in China, travels and everything in between. 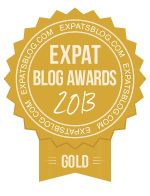 ExpatsBlog.com Expat Blog Awards 2013: China Gold Award! A very descriptive blog, that not only gives an insight into living in China, but loads of information and a taste of that adventure, that a new and different lifestyle brings. The positive message, despite the many quirks a foreign destination brings should encourage others to follow down a sometimes different but very rewarding path. I really like reading about Sarah's latest adventures. I think she has a natural flair for travel writing and would recommend her blog to those interested in learning more about China. I love hearing about Sarah's adventures in China (and other countries, such as New Zealand). It makes my life in England a little more exciting and always makes me laugh with her stories about the quirks of living abroad! It also contains lots of information for those wanting to visit China and work in a TEFL school. Expansive yet to the point. Hillarious yet thought provoking. Deep and enlightening, yet light and entertaining. "Sarah's Teaching in China: The Further Adventures of Sarah Bennet" is as full of contrast as is China, and swings wildely across the emotional spectrum as Sarah's wonderfull writing portrays with amazing accuracy the life as a "Laowai" (foreigner), with its wonderfull ups and terrible downs. Highly recommended! Funny and quirky Sarah's blog is shared with my friends too, and her pictures used to educate young people-the scorpions and cockerel feet were greeted with dismay, and her dangling of the Auckland sky tower used in a Physics lesson-after all you need to know your rope will not stretch...yet!! And how can they only just walk on the beach-this from a family of water babies!!!! Her Chinese adventures are inspiring, yes you too could travel and surprise the natives that you can understand and talk to them. The internet is great, but being there is greater. Bennett (aka The Penguin) is not only the most intrepid, adventurous, fearless, funny, clever, witty, chatty, mad, zany and beautiful young woman I know, but I also have the pleasure of being her great aunty! Not in an egocentric kind of way you understand...... (Or should that be 'grand', or second cousin once removed or something?) Any way, she never ceases to amaze and delight, with all her lovely stories and wonderful photos, her constant journal of all her experiences in that crazy place called China! I just cannot believe that all this time has passed, that she has travelled so far and so wide, seen so many amazing places, met so many wonderful people and been taken into the homes and hearts of Chinese families; and even squeezed in THE SPECIAL trip to New Zealand at Christmas! She has done, and is still doing, something that she loves and believes in, the enthusiasm just jumps out of the lovely photos. Her wonderful, expressive use of our beautiful English language just takes me there, sometimes amazes me, sometimes makes me laugh out loud, but certainly look forward to her next blog......! Aah yes, and you can tell she is a foodie and will try anything! Go girl, be proud - I am! What wonderfully observent blogs. Sarah has a real eye for the quirky as well as conveying a real feeling for the warmth and friendly nature of the ordinary Chinese people. I've been following Sarah's blog for about a year now. She always provides a great insight into her experiences and immersed herself well into the culture. She is certainly my go to person for everything China. I really enjoy following Sarah's blog. She has lots of great advice and useful links.Wonderful photography too - I like that she has herself and other people in her shots, which makes them more personal.I highly recommend her site and think she is worthy of winning the Expats award!